A retired electrician in southern France who worked for Pablo Picasso says he has hundreds of previously unknown works by the artist. The treasure trove of 271 pieces includes lithographs, cubist paintings, notebooks and a watercolour and is said to be worth about 60m euros (£50.6m). Pierre Le Guennec, 71, reportedly says Picasso gave him the works as gifts. But the estate's administrators have filed a case for alleged illegal receipt of the works of art. According to French newspaper Liberation, the lost Picassos include a watercolour from his Blue Period. Experts say the nine cubist works in Mr Le Guennec's possession are worth 40m euros alone. 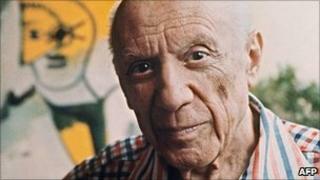 The electrician installed burglar alarm systems at Picasso's numerous houses in France, including his villa in Cannes, during the three years before the artist died in 1973. Image caption The treasure trove includes lithographs, cubist paintings, notebooks and a watercolour as well as sketches of the artist's wife, Olga. In September, Mr Le Guennec approached the artist's estate in an attempt to get the canvases authenticated by Picasso's son, Claude. But Claude Picasso dismissed Mr Le Guennec's explanation about how he came into possession of the art works. He said his father would never have given so many works to a single person. "To give away such a large quantity, that's unheard of. It doesn't add up," he told Liberation. "It was a part of his life." Once the works were authenticated, the family contacted France's specialist art police who have reportedly already raided Mr Le Guennec's home on the Cote d'Azur, confiscating the paintings and interviewing him under caution. The BBC's Christian Fraser, in Paris, says a multimillion-euro legal battle over the ownership of the paintings will now begin. New York's Metropolitan Museum of Art says Picasso produced more than 20,000 works of art during his long career, but hundreds have been listed as missing - in part because he was so prolific, the AP news agency reports.